Be the first to share your favorite memory, photo or story of Hobert. This memorial page is dedicated for family, friends and future generations to celebrate the life of their loved one. 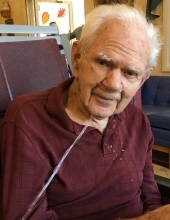 Hobert Lemaster, age 95, died November 30, 2018. His birth date was November 3, 1923 at Wilbur, Kentucky. He was preceded in death by his wife Earlene Wheeler Lemaster; His dad Lonnie Rosco Lemaster and his mother, Zora Fitch Lemaser. He had 11 siblings, all of whom are deceased except a younger sister, Earlene Lemaster Clay and her husband Bill Clay both of Grayson, Kentucky. He was a long-time member of Westwood United Baptist Church. He was a WW II Veteran serving in the Navy and a survivor of Okinawa. He enjoyed gardening and being out in the sun. His health had been declining for the past several years. He leaves behind a several loving nephews and nieces. Funeral service will be 11:00 AM Thursday at Westwood United Baptist Church with Elders AJ Williams and Clarence Thompson JR. officiating. Burial will follow in Sparks Cemetery in Blaine. Visitation will be Wednesday from 4-8 at Caniff Funeral Home in Westwood. To send flowers or a remembrance gift to the family of Hobert Lemaster, please visit our Tribute Store. "Email Address" would like to share the life celebration of Hobert Lemaster. Click on the "link" to go to share a favorite memory or leave a condolence message for the family.